By now, Rahul Gandhi’s hug of Prime Minister Narendra Modi has spawned a million theories. Everyone from political pundits to pop psychologists have their own version of what happened and why. It is exactly as the Congress president would want it to be. Even those who have criticised ‘The Hug’ for being too deflective and immature cannot stop talking about. My own theory is that irrespective of what the Congress president may say ‘The Hug’ (which has now entered the lexicon of Lutyens) was the opposite of a spontaneous outburst of warmth and generosity. Yes, it could be an attempt by Rahul, who is roughly two decades younger than the prime minister, to offer a more contemporary and metrosexual alternative to Modi’s 56-inch hardline machismo. But everyone knows that slogans like “Make Love, Not War” or “Fight, Don’t Hate” are good for bumper stickers, fridge magnets and T-shirts; not so much for winning elections. I would wager that the only part of the unexpected and dramatic developments in Parliament that was unscripted was ‘The Wink’ that followed the ‘The Hug’ (a new variation on ‘nudge nudge, wink wink’ is ‘hug hug, wink wink’). When Rahul cheekily winked at Jyotiraditya Scindia moments after he had shocked the treasury benches with his embrace, it was the sign of a man who knew he had won the next morning’s headlines. I do not think Rahul Gandhi necessarily knew it had been caught on camera and I do not think he cared. But the hug itself was a smart, strategic move of pure politics and probably one that had been planned months in advance. In military terms this is what you would call a classic ambush: engage your enemy on a familiar battle-turf by shooting at him and then suddenly trip him when he least expects it. 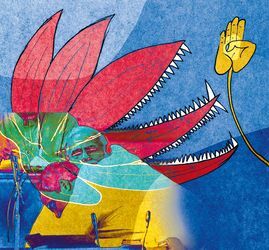 The BJP was much better prepared to deal with the scathing critique of its performance than it was to deal with any unexpected displays of affection. Given that the visceral personal dislike between the Gandhi family and Narendra Modi is a pretty well-known fact, you can argue that the Congress leader’s flamboyant move was disingenuous. Probably so. But it does not make it any less legitimate as an act of politics. In fact ‘The Hug’ was almost Modiesque in its capacity to draw attention more to the optics of the moment than to its substance. By itself it may do nothing to change the electoral ground game. But, for once, Rahul Gandhi—so often described as the reluctant politician—seemed more easy-going and relaxed than Modi, who took a few seconds to recover from the unexpected gesture. That the BJP and its supporters spent so much time on social media fulminating over ‘The Hug’ proved its own point. ‘The Hug’ finally settled one thing; no matter how many times the BJP may mock him, in the ruling party’s mind, it is Rahul Gandhi who is their main challenger for 2019. The federal front may not think so and Rahul may have annoyed them further by hogging the airwaves. But, that the prime minister spent much of his parliamentary speech attacking only the Congress, virtually ignoring the rest of the opposition, should tell you something. ‘The Hug’ may not win Rahul Gandhi any extra votes. But it is what most people remember about the no-confidence motion, even though it was the BJP that won handsomely. Now that is called changing the headlines. And, that was once a skill unique to the Modi-led BJP government. Are the communications tables turning?